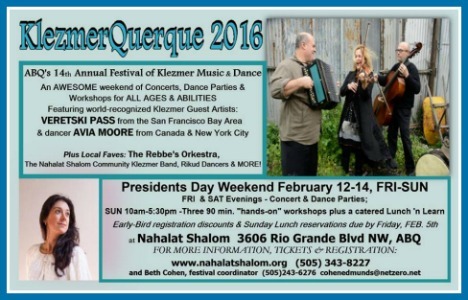 The 14th Annual KlezmerQuerque is a three-day festival of concerts, workshops and dance parties featuring ‘Klezmer’ which is the traditional dance and instrumental music based in the ancient wedding ceremonies of the Eastern European Jewish people. The festival will take place from February 12-14, 2016 (Friday evening through Sunday evening) over Presidents Day weekend. KlezmerQuerque is produced by Congregation Nahalat Shalom, its 23-piece inter-generational Community Klezmer Band and Rikud Yiddish dance troupe. The festival presents a wide variety of events for all ages and abilities with prices ranging from free to $20 per event. three 90 min. hands-on workshops for instrumental music plus a “Lunch ‘n Learn’ on Sunday, February 14 between 10:00 am and 5:15 pm. Here is a forshbite (that's Yiddish for hors d'oeuvres, one of the most-looked-up words on the Internet) of what's in store for Albuquerque: Veretski Pass plays Yankee Doodle Dandy at one of their workshops - first straight, then in a Jewish hosidl style, then in a Ukranian kolomeyke style.